My first test run on the pink sprinkles worked quite well, which gave me the incentive to expand on the color trials. 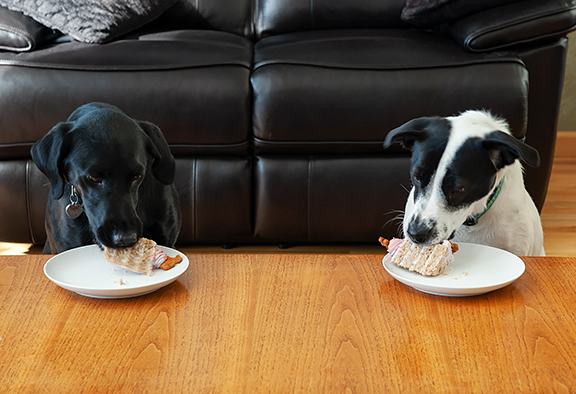 I opted for green sprinkles from parsley juice, which tasted weird to me, but the dogs didn’t care. If you want green sprinkles that don’t taste like Italian parsley, you can use matcha as a dry coloring. And I went for some blue sprinkles made from steeping red cabbage in boiled water, straining the tea, and stirring in baking soda. Yay for chemistry! The color was gorgeous, but unstable. Over the course of an hour, the leftover coloring turned teal. This may have been a result of me adding too much baking soda (base) because the color didn’t turn blue right away. 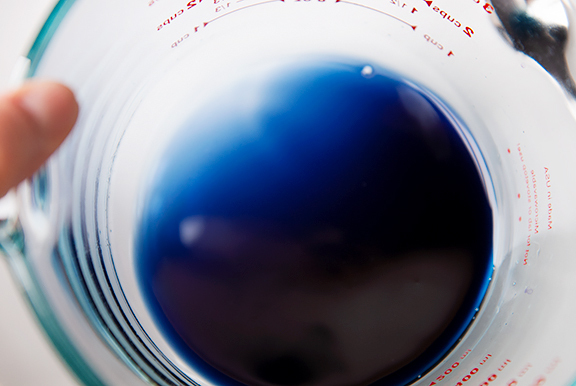 To reverse the over-greening of your blue coloring, you can add a drop of white vinegar (acid) to turn it more purple/back to blue. When mixed into the icing, the color was just fine and remained a pretty sky blue. 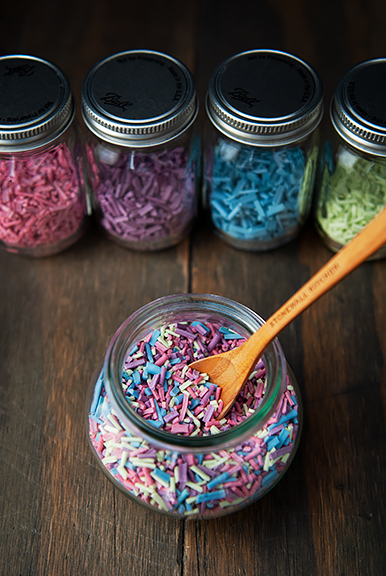 The sprinkles stayed that color for three days and then turned a pale teal in the jar, however the blue sprinkles that were mixed with the other colored sprinkles were still blue after three days. 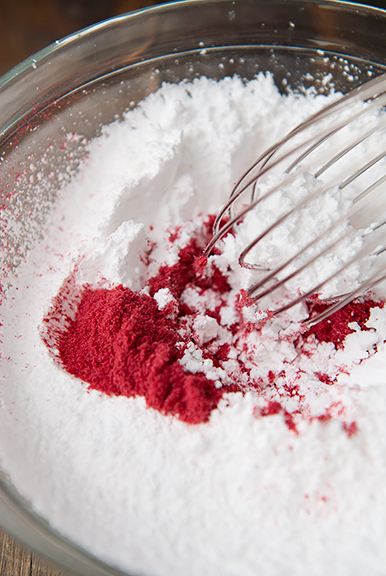 For dry colorings, I sift those powders with the powdered sugar first. 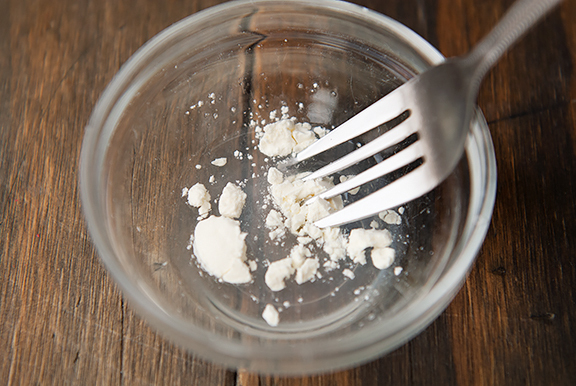 Reconstitute your powdered egg white with water or use fresh egg whites (measurements are listed in the recipe at the end) and stir that into the sugar. This results in a thick paste that is too stiff to pipe. Start stirring in 1/2 teaspoon of water at a time to thin the icing to a pipeable consistency. If you are using liquid colors, add the liquid color in place of the water until your desired tint is achieved. 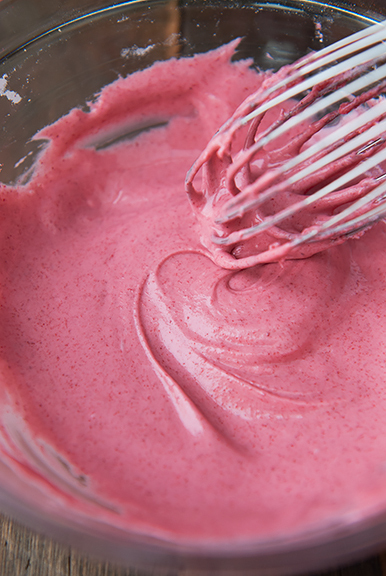 If the icing is still too thick, switch to adding water instead of the coloring. The final icing should be smooth and not too runny. Make sure to get any lumps out to avoid clogging your piping tip. 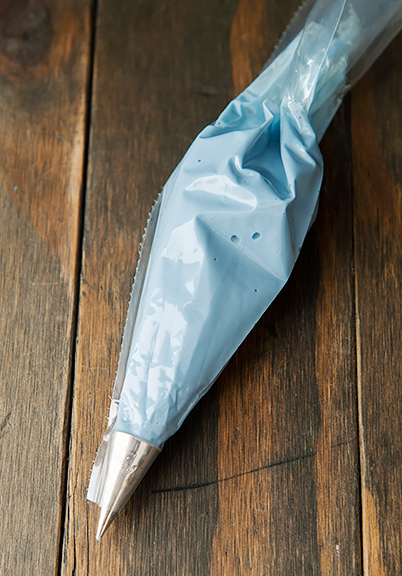 Fill a piping bag fitted with a Wilton No. 2 tip. This is a plain tip with a 1.5 millimeter diameter (I just measured it with a bright light source and an 8x magnifier and got a second verification from Jeremy). 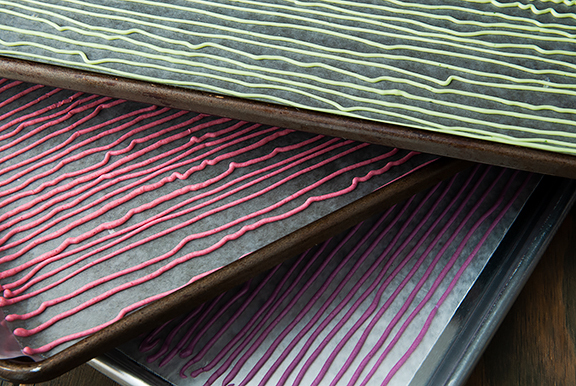 Pipe straight lines of icing on wax or parchment paper until the icing runs out. 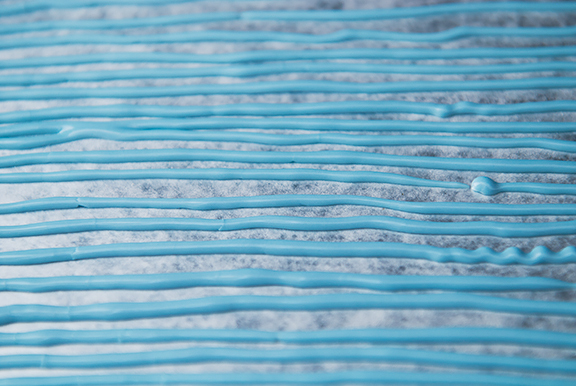 Allow the icing to dry for 24 hours or until the lines break cleanly rather than smearing. Gather the dried icing lines together. I find it easiest to lay my knife flat and run it under the icing strips to separate them from the wax paper. It’s okay if they break because you’re going to chop them up anyway. 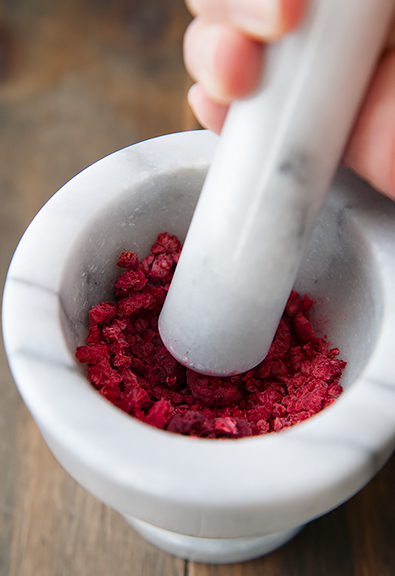 A full batch should fill an 8-ounce jar, but makes about 4 ounces by weight. I made half and quarter batches. The raspberry sprinkles taste the best – they taste like raspberries. The blueberry sprinkles have a more subtle flavor, but still good. 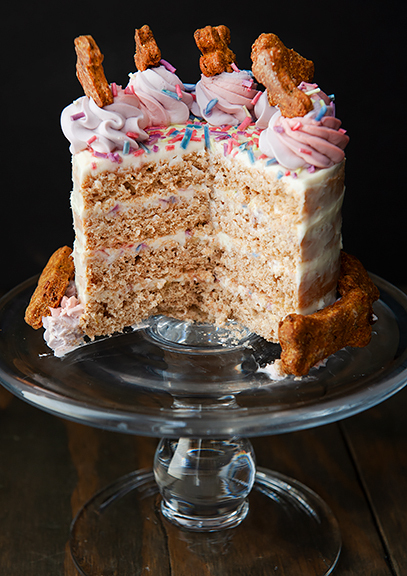 The blue and green sprinkles were a bit odd to eat, but you may be able to mask their flavors with some almond, lemon, or peppermint extract if these are intended for people rather than dogs. Overall, I was delighted with the results and positively thrilled to get such a beautiful array of colors from natural food sources. And they gave Yuki’s birthday cake that extra special touch. *You can use 15g of egg white (about half of an egg white from a large egg) in place of 1 teaspoon of egg white powder and 1 tablespoon of water. Sift the powdered sugar into a medium bowl. In a small bowl, whisk the egg white powder and 1 tablespoon of water together until frothy. 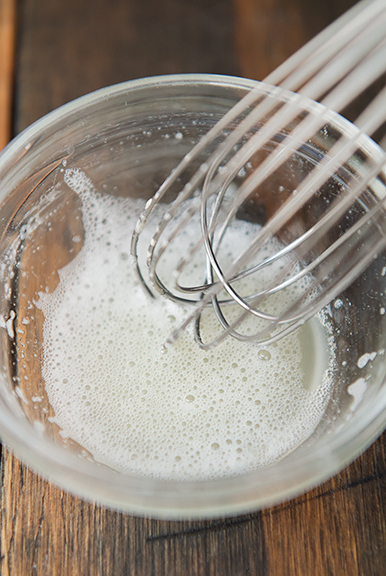 If using fresh egg white, whisk until frothy. Stir the egg white (reconstituted or fresh) into the powdered sugar. Add more water, 1/2 teaspoon at a time, until the icing is thick and smooth. It should be thick enough to hold a shape but thin enough to flow and be piped. Lay a sheet of wax or parchment paper down on a flat work surface. Scrape the icing into a piping bag fitted with a Wilton No. 2 plain piping tip. Because the tip is small, it will clog easily, so be sure that your icing is smooth and without any lumps. 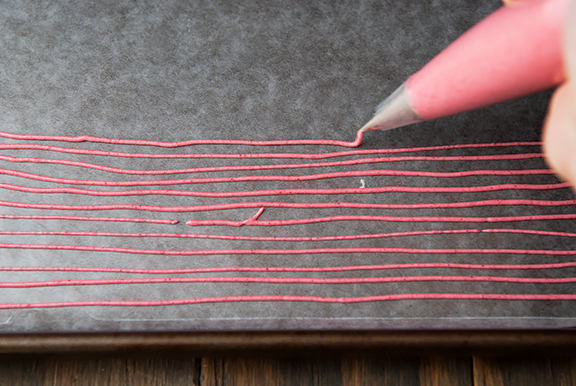 Begin piping long straight thin lines of icing on your paper and repeat until you use up the icing. Allow the icing to dry for at least 24 hours. When the icing is completely dry (it should be brittle and break cleanly versus smearing because it is still wet), lay a sharp knife flat and run it under the icing lines to separate them from the paper. Gather the icing strips together in the same orientation and cut them into small pieces. Store in an airtight container. Makes 4 ounces. 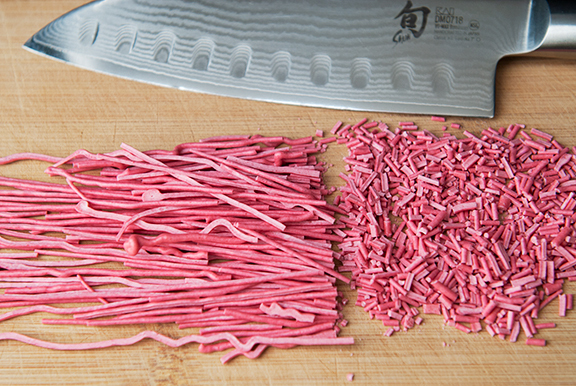 To make pink sprinkles: Crush 1/4 cup of freeze-dried raspberries or freeze-dried strawberries into a powder. Sift the powder through a fine-mesh sieve. This should yield about 2 tablespoons of powder. 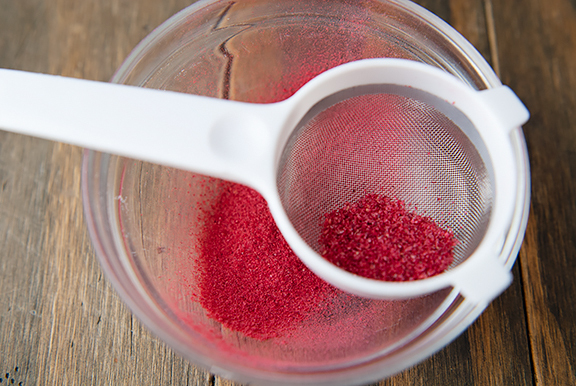 For a lighter pink, use less of the berry powder. 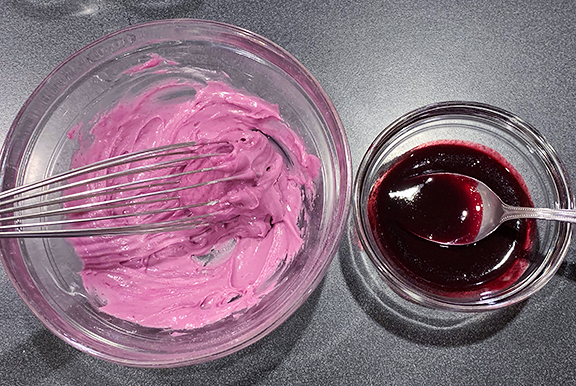 For a darker pink, use the 2 tablespoons of powder. 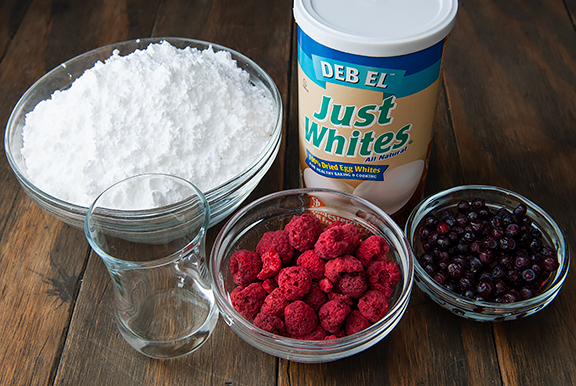 Sift the berry powder and powdered sugar together and proceed with the rest of the recipe. 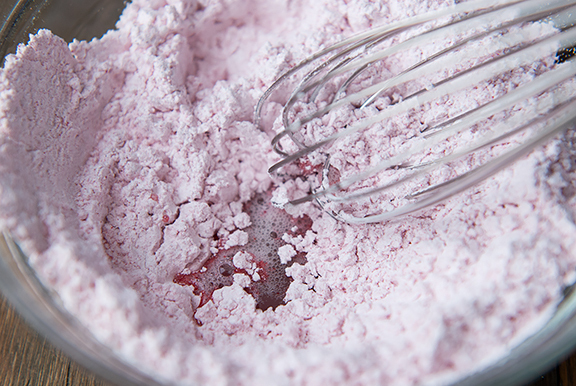 To make purple sprinkles: Crush 1 cup of fresh blueberries and place in a small saucepan over medium heat. 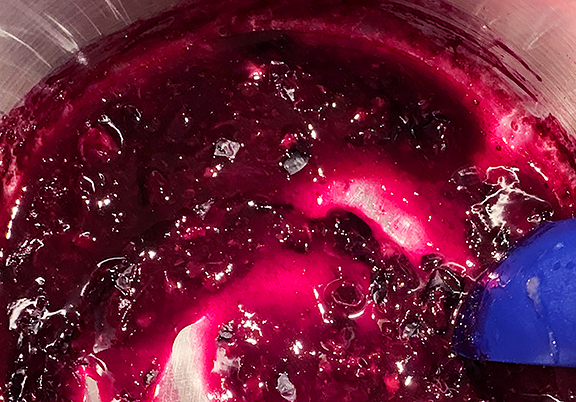 Stir constantly until the berries turn deep violet. Remove from heat. Strain/press through a fine-mesh sieve. You should get about 1/2 cup of thick liquid. 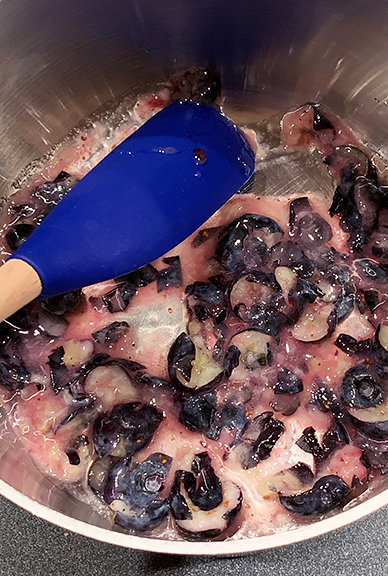 Make the basic sprinkles recipe, but instead of using water to thin the icing, use the blueberry liquid until desired color is achieved, then add any additional water to get the right viscosity. To make green sprinkles: Wash 1 1/2 cups of fresh parsley leaves. Freeze the leaves for 1 hour. Mince or purée the leaves and squeeze as much liquid from the leaves as you can. Strain the liquid through a fine-mesh sieve (any little bits of leaves WILL clog up the piping tip). You might get 2 tablespoons of liquid. Stir the parsley liquid into the icing instead of water to thin it. This yields a light green color. It tastes very weird. 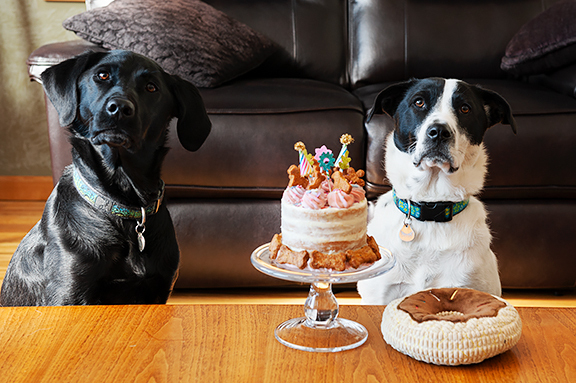 Dogs won’t care, but humans will. If you are making green sprinkles for human consumption, try using matcha powder instead of parsley and add 1-2 teaspoons to the powdered sugar before sifting (and proceed with the rest of the recipe). 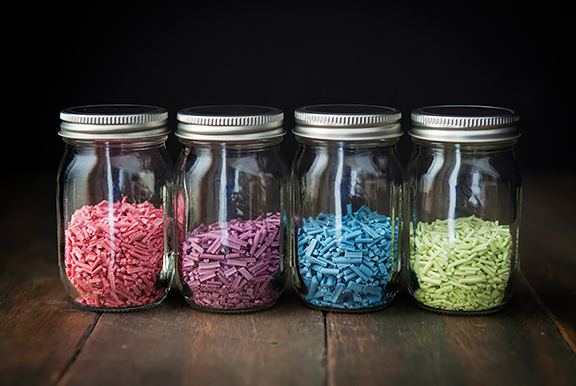 To make blue sprinkles: Place 2 cups of shredded red cabbage in a saucepan with 1 1/2 cups of water. 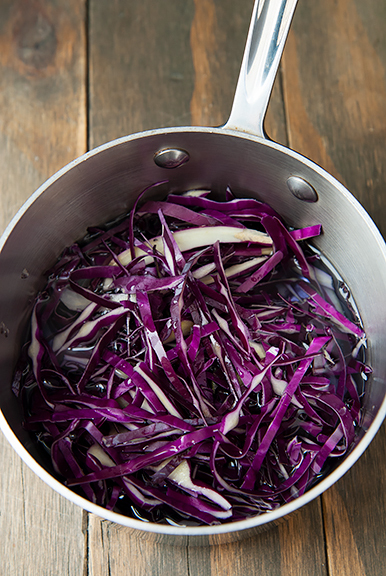 Bring the cabbage to a simmer over medium heat. Remove from heat and let steep for 15 minutes. 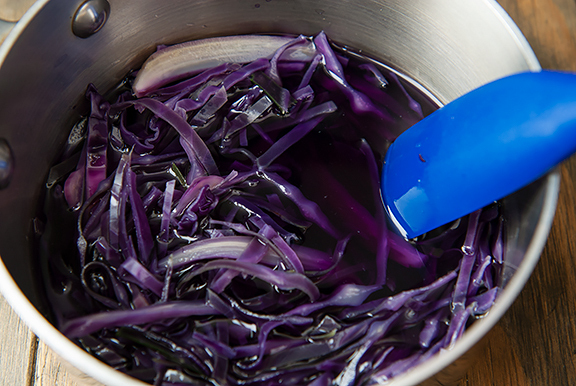 Strain the liquid into a vessel and discard the cabbage. Return the liquid to the pan and bring it a boil. Reduce the liquid to 1/4 cup volume. Stir in a pinch of baking soda. 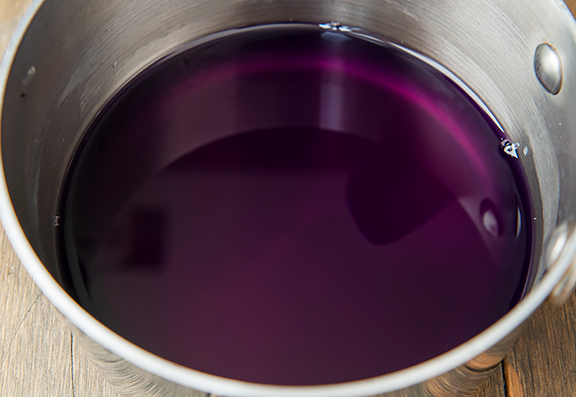 The liquid should turn from purple to blue – give it a minute or so if it doesn’t happen right away. If it isn’t blue enough, add a little more baking soda. If you added too much, it will start to turn greenish. To reverse this, add a few drops of white vinegar. Let the liquid cool completely. Use the blue liquid to thin the icing instead of water until you reach the desired shade. I used most of the liquid to get a sky blue color (before that, the icing looked grey), but after an hour I noticed my remaining liquid had turned teal. 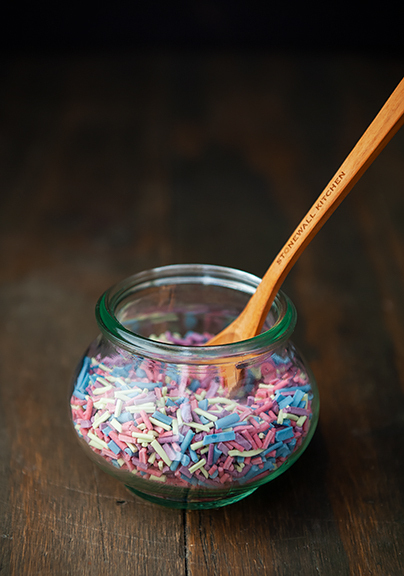 The sprinkles turned from blue to teal after a couple of days in a sealed jar. For something more stable, you might try butterfly pea powder. Happy Birthday Yuki! 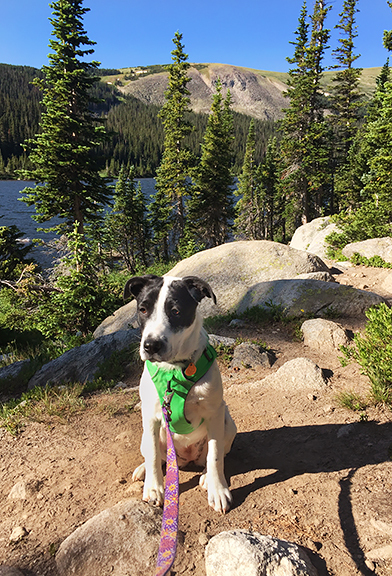 You’re one lucky, much loved pup. Happy birthday to Yuki. What a story! Do you know what happened to her mom? I hope she is living in a forever home now. (Big Grin!) I love how you love your pups! Happy, Happy Birthday, Yuki!! Wow. Born into desperate homelessness, then arriving at her first birthday with a loving mom making homemade sprinkles in her honor. Hollywood could not beat Yuki’s story! Happy Birthday, Yuki!! Your story is very compelling with such a happy ending!! 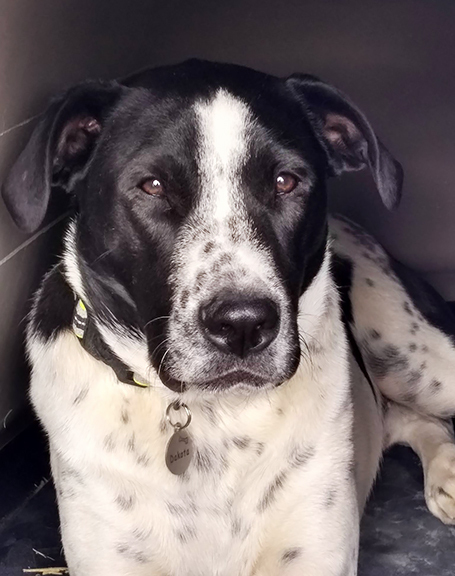 All our animals (horses too) are rescues. 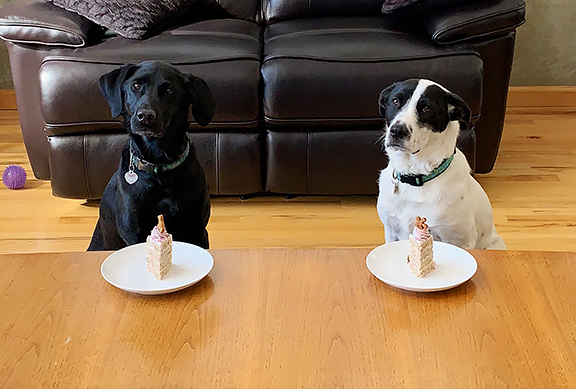 Its the best way to build a four-footed family! All beautiful pups. That Dakota, handsome indeed. 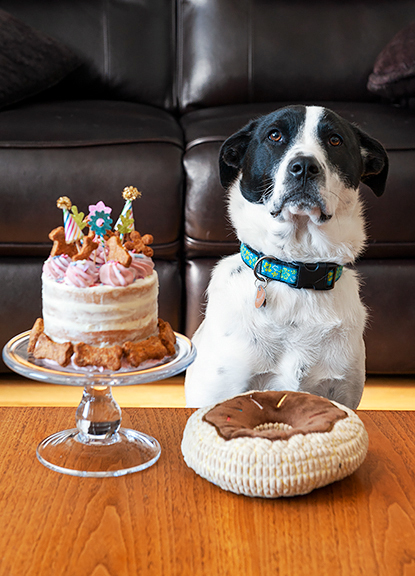 Happy Birthday to Yuki, I wish all dogs were so lucky and so loved. I have been following you for years. 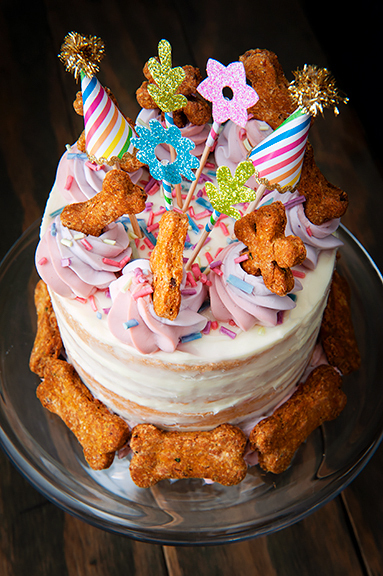 I must admit, I LOVE your blog; this one, in particular is my FAVORITE as it clearly shows your love for your pups. They are truly blessed to have you as their mom. You rock! I have an old lady rescue and she’s the best! Happy Happy Birthday, Yuki. I’m so glad I knew the “end” of the dog-family story before I started reading. Imagining what our poor animals go through before they get to us is heart wrenching. Thank goodness for kind people who step in to help (and pox on that trailer-owner for kicking out the mama and puppies). 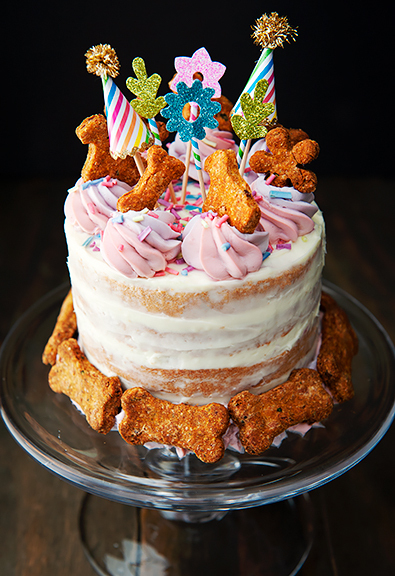 Beautiful sprinkles and birthday cake. Good girl, Yuki for sharing with your sister!